Over the last few weeks, the Chime research team set out to learn more about today’s college students by surveying 1,030 college juniors and seniors. 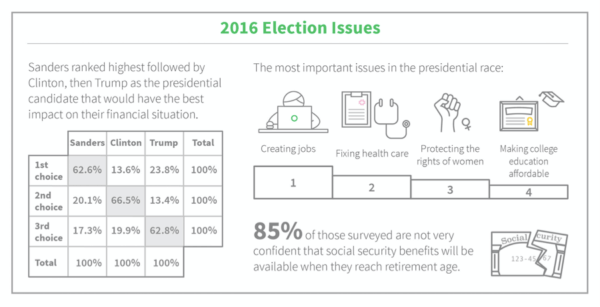 We asked about their financial mindset, job prospects, student loans, and their take on the upcoming Presidential election as it relates to their finances. The results are in, and we’ve compiled the findings in our latest Millennial Money Mindset Report: The 2016 University Edition. 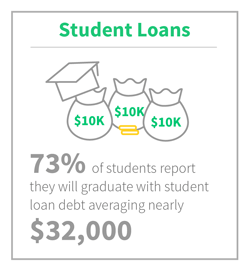 With 73 percent of respondents reporting that they will graduate with an average student loan liability of $32,000, college debt continues to be a massive burden for Gen-Y grads. For context, Consumerist reported that the average student loan debt in 2004 was $18,550. This elephant in the room is what economists fear will hamper Millennials’ pursuit of homeownership and retirement savings potential. Surprisingly, however, high college debt has not dampened this group’s savings ethic according to the survey results. In another recent study, CareerBuilder found that 2016 could be the best hiring environment for new graduates since 2007. Despite this rosy outlook, 67 percent of college seniors we surveyed did not have a full-time job lined up after graduation. 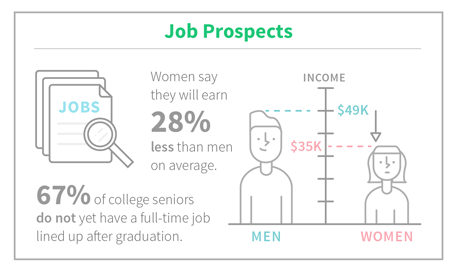 In addition, our findings highlight that there continues to be a significant gender wage gap. On average, female students in our study estimated they would earn 28% less in their first year than graduating men. Perhaps one of the most encouraging findings was this group’s strong savings ethic despite being faced with significant student loan debt and uncertain job prospects. 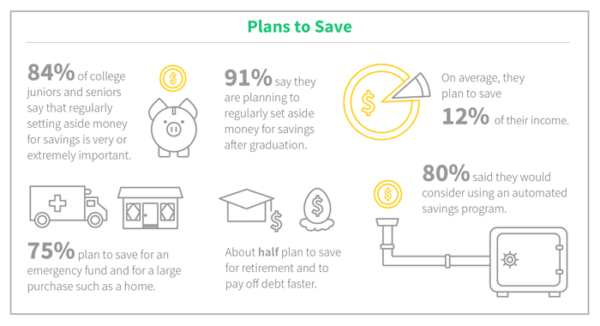 Among respondents, 84 percent said saving is very or extremely important, and 91 percent of all students said they are planning on saving regularly, with plans to set aside 12 percent of their future income on average. To help them save, 80% said they would consider using an automated savings program to allow them regularly set aside money for savings without thinking about it. When asked to tell us the list of things they plan to save for, 75 percent of respondents said they would save for an emergency fund. The same percentage said they’d save for a major life purchase such as a home or wedding. Over 50 percent of respondents are also planning to save for retirement and to help pay down debt faster. In last year’s 2015 Banking Barometer (part of the Millennial Money Mindset series), we learned that Millennials are surprisingly similar to their parents when it comes to one thing–where they chose to open their current bank account. What’s more surprising is that many have stuck with their bank for years even though they are overwhelmingly dissatisfied, and would not recommend their bank to a friend. In this 2016 University Edition, we saw again that this group of college-educated Millennials rely heavily on their parents when it comes to financial matters. For college juniors and seniors, parents are by far their number one resource for financial advice (57%) while only 13 percent say they rely on their bank for financial advice. Over 80 percent of college juniors and seniors are considering switching to an online or mobile bank. Not surprisingly, the vast majority of the college juniors and seniors we surveyed– 63 percent –said Sen. Bernie Sanders was the best candidate to address their financial needs. Clinton ranked second best, followed by Trump in third. When we asked about the most important issues our next president needs to address, the top policy priorities for our students were related to job creation, fixing healthcare, protecting women’s rights and making college affordable. Additionally, 85 percent of students expressed doubts about social security surviving into their retirement years, which could signal why this group is so focused on saving. As today’s college grads enter the workforce with mounting student debt, the financial habits they establish early in their careers, and their ability to get ahead or make ends meet will have an enormous ripple effect on the economy. Previous studies have indicated that those in debt are postponing home purchases, marriage and having kids. Student loan debt has also been shown to limit those who might pursue starting a business, hindering entrepreneurship which fuels much of our country’s economic growth. Debt can also make it harder for borrowers to set aside money for retirement at a time when there’s uncertainty about social security. The silver lining in this study is that the vast majority of these students, despite their current job prospects and debt burden, have a strong savings ethic. Likely they learned it from their parents, as our survey found that students look to mom and dad as their number one resource for financial advice. Furthermore, these young, college-educated Millennials and are focused on saving for the right things. The majority are planning to save for an emergency fund, retirement, and in general, they plan to save in order to afford big-ticket items without racking up additional debt. The question now is: will college grads turn their savings ethic into healthy savings habit? In other words, will they follow through on their plans to save once they are faced with the day to day money decisions of life after college? In our 2015 Cravings for Savings report, we found that 40% of Millennials don’t regularly budget or save even though they know it’s important. There’s clearly an opportunity to help young adults form healthy habits through education and tools that help simplify money decisions and automate important aspects of their financial lives.